It’s an “off-week” for meta constructor Matt Gaffney and in his place we have one of the gods of the cruciverbial pantheon, Patrick Berry. He asks us for a five-letter word, which isn’t much to go on, but let’s see what hints develop along the way. So the only thing left was to figure out how each of these pairs contributed a letter to the final meta answer. Well, it’s pretty obvious that in each pair, one word anagrams to the other with the addition of one extra letter. Those letters are highlighted in red above: ITSWN, which itself anagrams to TWINS and our (appropriate, given the almost identical pairs above) meta answer. Starting in the northwest, I had MACHO for MANLY ([Strong and brave]), leading me to MATCH instead of EQUAL for [Keep pace with]. Thanks for the ride, Patrick and Mike! This entry was posted in Contests and tagged Patrick Berry. Bookmark the permalink. Wonderful puzzle! Like you said, I felt the clue for TWISTER was a bit strained, but technically it’s correct (it doesn’t say that the shapes are all different). 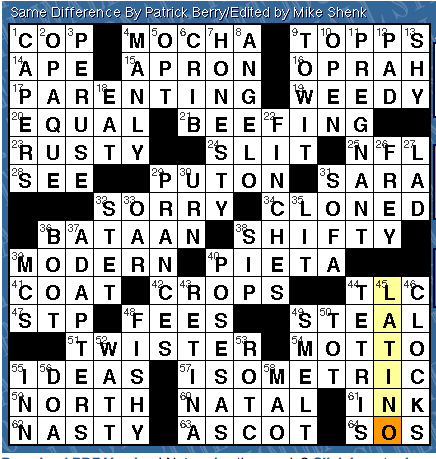 My post-solve moment of paralysis didn’t last as long as did for PB’s last outing (the “Long and Winding Road” one), but the solution was just as satisfying. This puzzle was brilliant. I can’t imagine how Patrick found these word pairs. Very well done. Couldn’t agree more. When I finished the meta I had to stand back and admire the genius of it. I loved the puzzle overall, but am surprised there aren’t any comments about 4D: Strong and brave = MANLY. Since I was early into the solving when I got to it, I thought there might be a rebus involved, but couldn’t figure out which part of valiant or womanly would be the multiple letters in the grid.